story. Because this was the first needlepoint project I had ever designed, I was not knowledgable when it came to the amount of yarn I would need. A local craft store was clearing out it's needlepoint yarn - at obscenely low prices - so I purchased most of what they had. What they had was yarn in a wide range of colors, but in small quantities. This encouraged me to choose something colorful to design that would use small amounts of yarn. So, my first choice was butterflies. Once that section was finished, I decided to try birds, then flowers and finally, fish (mostly tropical). As you can tell, I pretty much made it up as I went along. There was no grand plan to the project. After it was complete, I approached a local woodworker that I knew, explained what I wanted and he created the beautiful, one-of-a-kind frame. 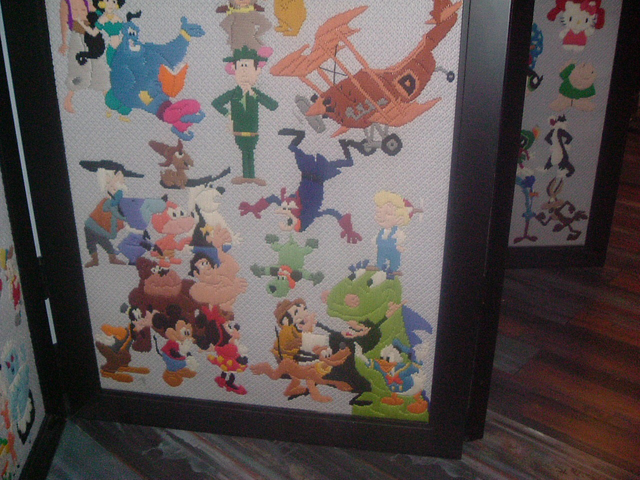 The entire project was worked in Long Stitch. I simply drew butterfly or bird or flower or fish, placed the 10-mesh mono canvas over the design and traced it onto the canvas. 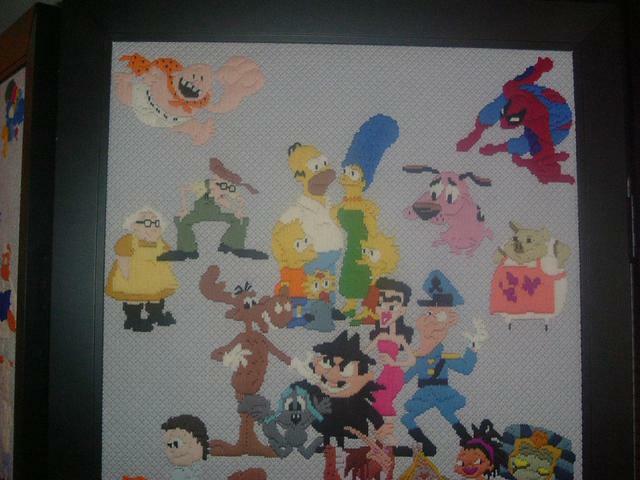 From there, I worked the stitches directly onto the canvas. No counting was necessary because the design was already on the canvas! Pretty cool, huh? It took me about a year to complete. particular stitch group. For example, Crossed Stitches will list all stitches in the cross stitch group - this is any stitch that crosses itself at some point. create beautiful works of art? from the beginner to the old pro. subscription ($ 14.99) via paypal (see buttons on the left and right) and you will have access to hundreds of stitches and helpful hints. For those of you who are new to stitchopedia.com, click here for a sample page featuring diagrams and instructions for the Ray Stitch. I named this piece "The 4 F's" (fish, fowl, flowers, flutterbys). 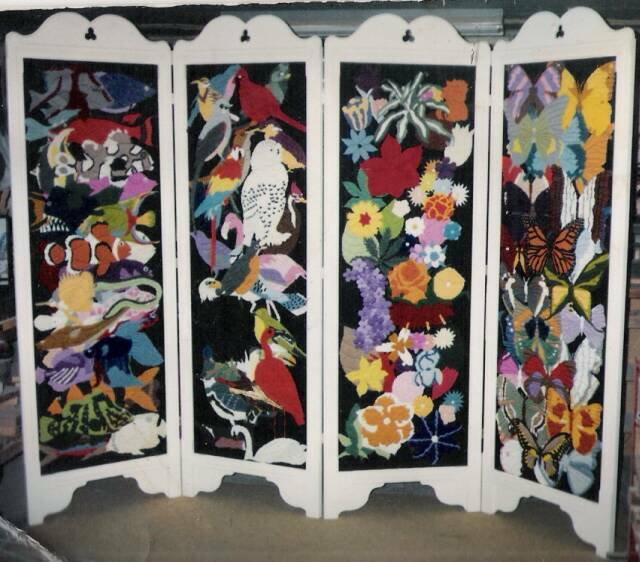 This project is a free-standing, four piece, hinged room divider that stands 6 feet tall with the hand carved frame. Each section is 2 1/2 feet wide, plus frame. 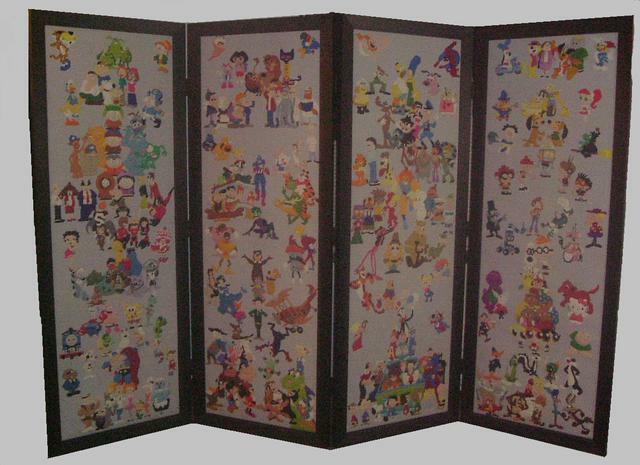 I have also designed and stitched another 4-piece room divider, with cats and dogs as the theme. Unfortunately, it was destroyed a few years ago in a house fire. Fortunately, no lives were lost or injuries sustained. 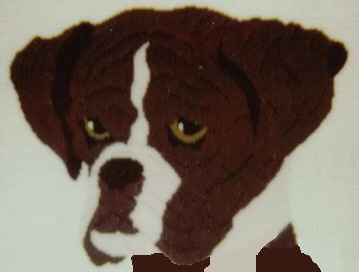 I have recently decided to use some of the dogs and cats from that design for projects here, at stitchopedia.com. The first one is called Boris, The Boxer. You will see the FREE LONG STITCH design ads throughout the site for this project, or you may simply click on the image to be taken directly to him. wood, making it attactive from whichever angle you view it. It will fold together for ease of transportation. It was inspired by Japanese Silk Screens. Unable to afford a Japanenese Silk Screen and having no knowledge of silk screening techniques, I decided to try designing my own, using needlepoint. 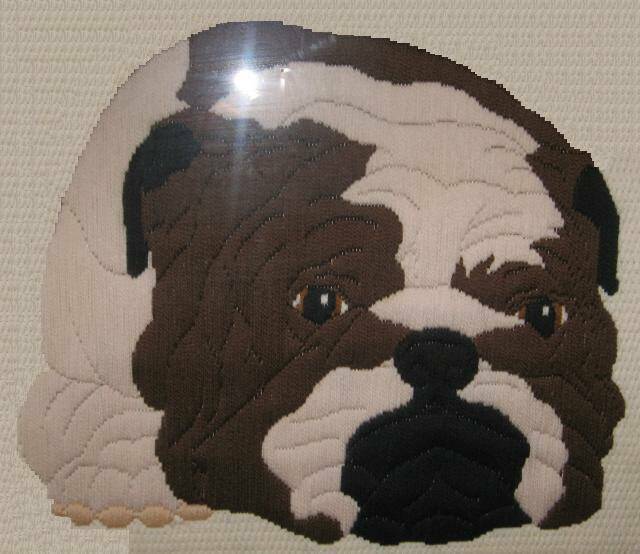 Basil, The Bulldog is another long stitch design that I am offering as a free download for stitchopedia members. He makes an excellent companion for Boris, The Boxer. As a matter of fact, he is worked in almost all the same colors! continues on the right side of each page. Click on a specific stitch and you will be directed to the page demonstrating that stitch. You may also use the google search box to search for a specific stitch. Simply type in the stitch you are looking for, check the www.stitchopedia.com box ( if this box is not checked the search will be web-wide) and click on search. At this time, you will be directed to a list of search results. 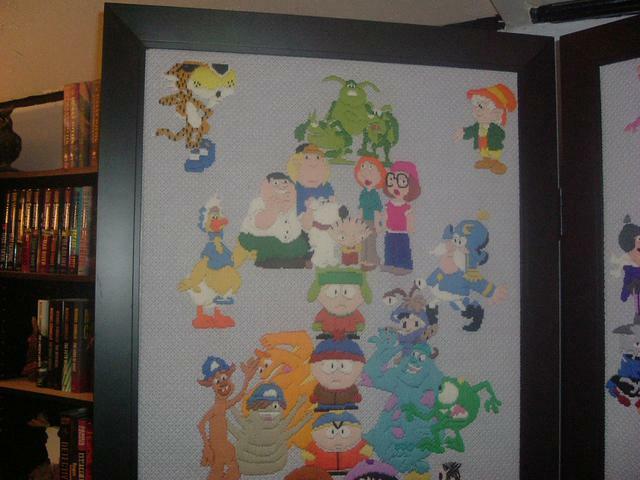 I named this needlepoint project, "Animated". It stands almost 7 feet tall with hinged frame. The frame folds up for ease of moving the piece. As you can see, there are four panels. Each panel is 2 1/2 feet wide. The background is a light grey, the frame is black. 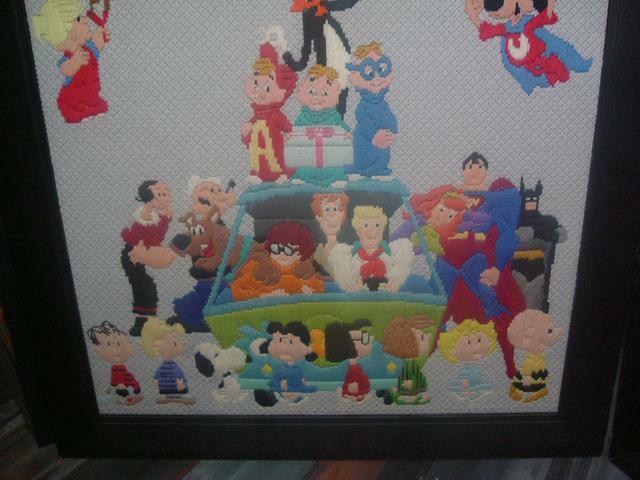 The animated characters span decades and are taken from cartoons, comics, commercials and children's books. Below you will find some close-up images of each panel. This is the top of Panel 1. 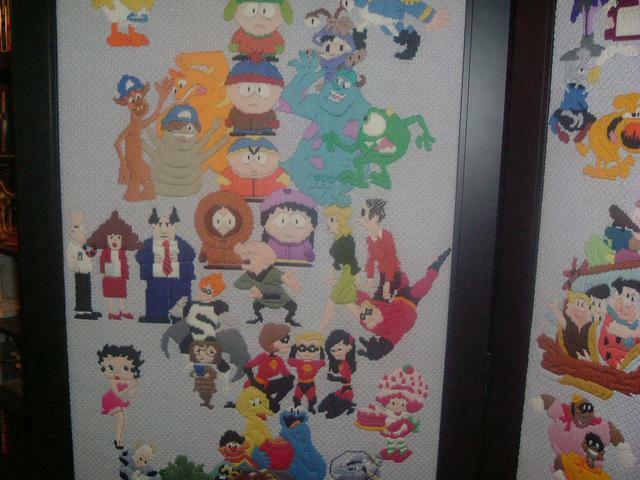 You can see the Cheetos cheetah, the Raid bugs, Mr. Keebler, Captain Crunch, the Family Guy family, the characters of Monsters, Inc and some of the Southpark characters. This is the bottom of Panel 3. You can see the Scoobydoo gang, Superman, Batman, the Chipmunks, Dennis the Menace, Underdog and the Peanuts gang (walking in front of the Scoobydoo Mystery Machine). 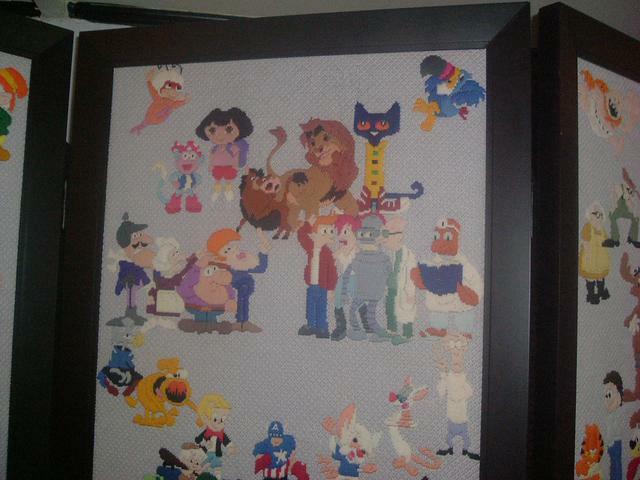 This is the top of Panel 2..
You can see the Lion King, Pete The Cat, Dora The Explorer, Toucan (Froot Loops commercial) and the Futurama characters. This is the top of Panel 3.. This is the top of Panel 4.. This is the bottom of Panel 4. 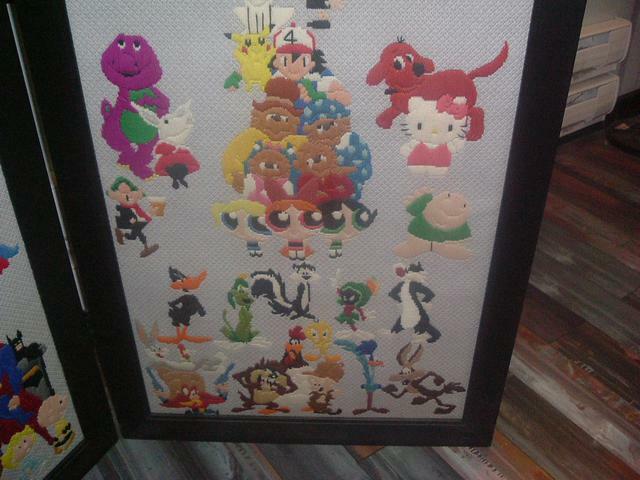 You can see the Warner Brothers characters (Bugs Bunny, Pepe LePu, Road Runner, etc. 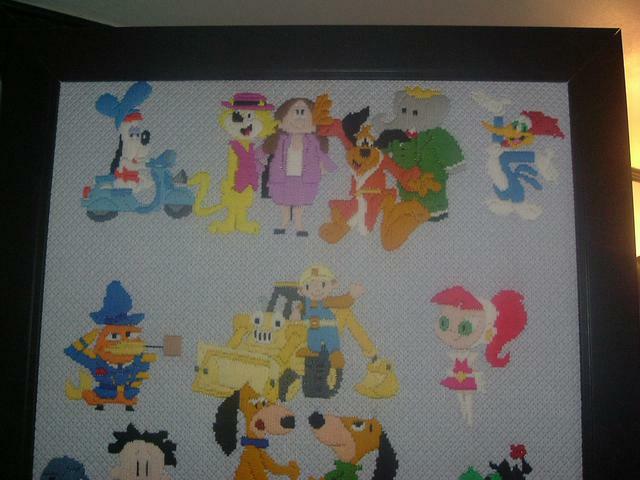 ), the Powder Puff Girls, Andy Capp and Olivia. This is the bottom of Panel 1. 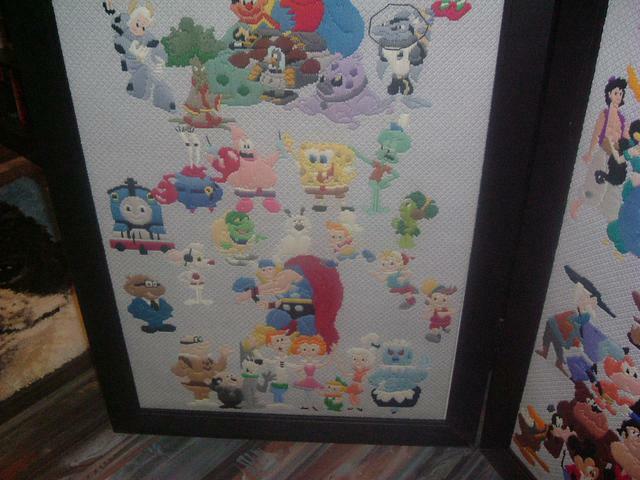 You can see the Jetsons, Thor, Thomas The Train, the Spongebog characters and the characters from the Rice Crispies commercials (Snap, Crackle and Pop). This is the middle of Panel 1. 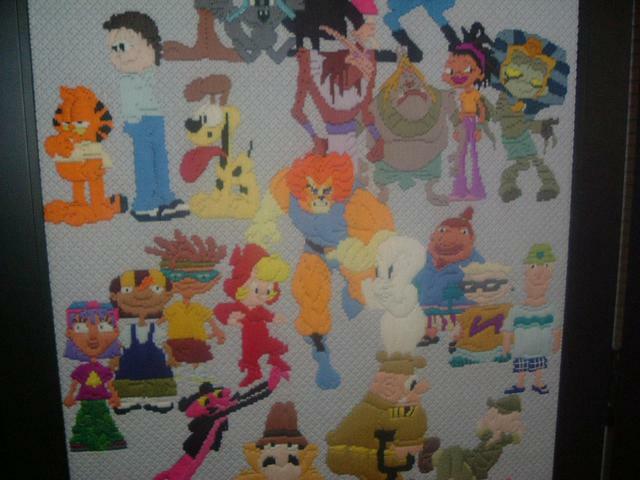 You can see the Incredibles characters, Strawberry Shortcake, Betty Boop, Dilbert and some of the Sesame Street characters. 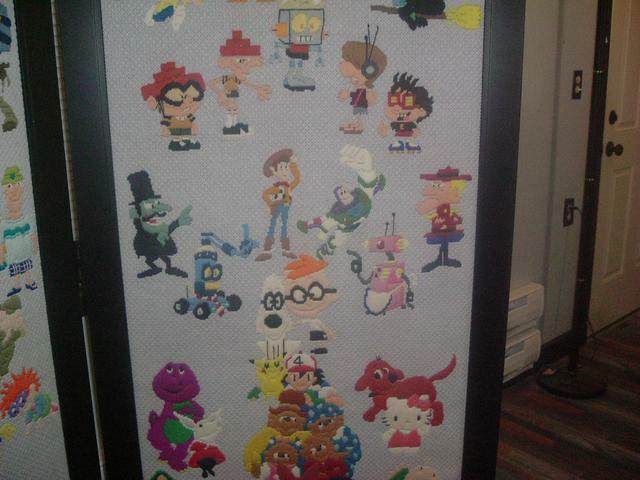 This is the middle of Panel 4..
You can see Mr. Peabody and Sherman, Clifford the Big Red Dog, Hello Kitty, Barney, Dudley Do Right, the Toy Story Characters and the Berenstein Bears. This is the middle of Panel 3.. 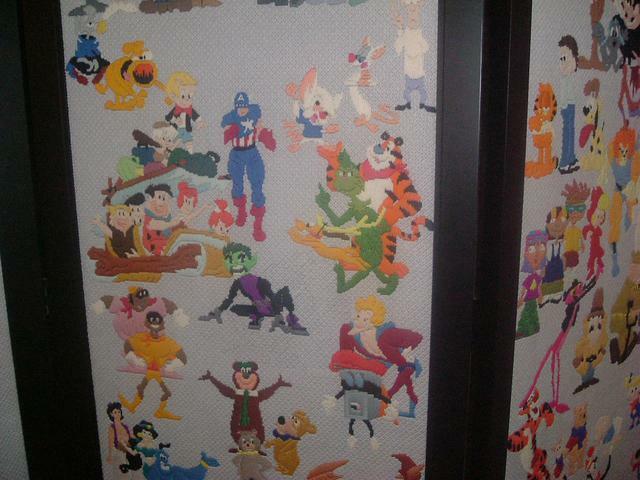 This is the middle of Panel 2..
You can see Captain America, Tony The Tiger, The Grinch, The Flintstone, Fat Albert and Yogi Bear. This is the bottom of Panel 2..